This month's challenge is to a Create a project using WATERCOLOR! Get your your watercolor pencils, paints or inks and play along! You have two weeks to play along. Deadline to enter is Friday, April 10th, 2015 at Midnight CST. The winners will be announced on the NND blog on Monday, March 9th. Post your project to your blog or to an online photo gallery such as Flickr , Pinterest, or splitcoaststampers (on splitcoast please use keywords newtonsnook and IPC19). Larissa created this gorgeous floral card using our new Beautiful Blossoms Stamp set. I love the layers she cut with the watercolored flowers! Yukari tried the "no line" stamping technique with watercolors on the kitty from Newton Dreams of Paris stamp set! So beautiful! Jess tried some fun watercolor techniques on her card - head over to her blog to see a video too! She used our Simply Sentimental and Wild about Zoo stamp sets. Love the water splatter! 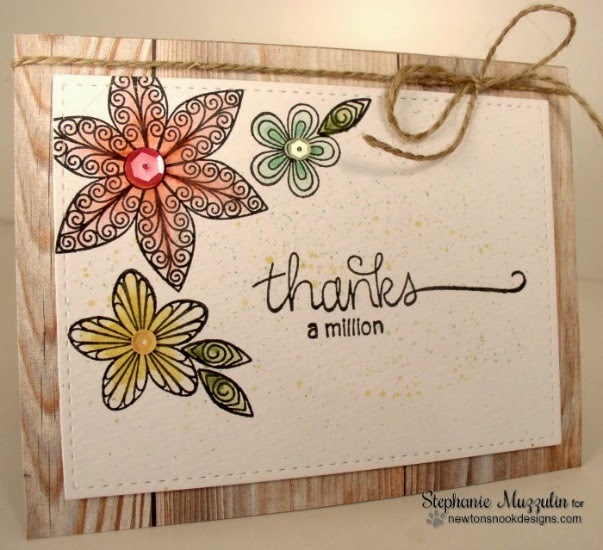 Stephanie created this charming card with our Beautiful Blossoms stamp set! I love the watercolored blooms and the bits of watercolor splatter! She also used the words from our Simply Sentimental stamp set. Here is a sweet card by Samantha using watercolor as a background. 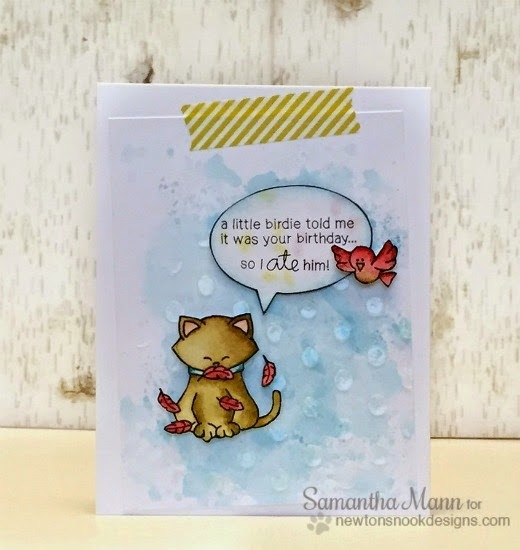 It's so beautiful how she watercolored the kitty from our new Newton's Birthday Flutter too! Here's one by me - I watercolored a fun background for the Eiffel Tower from our Newton Dreams of Paris stamp set!